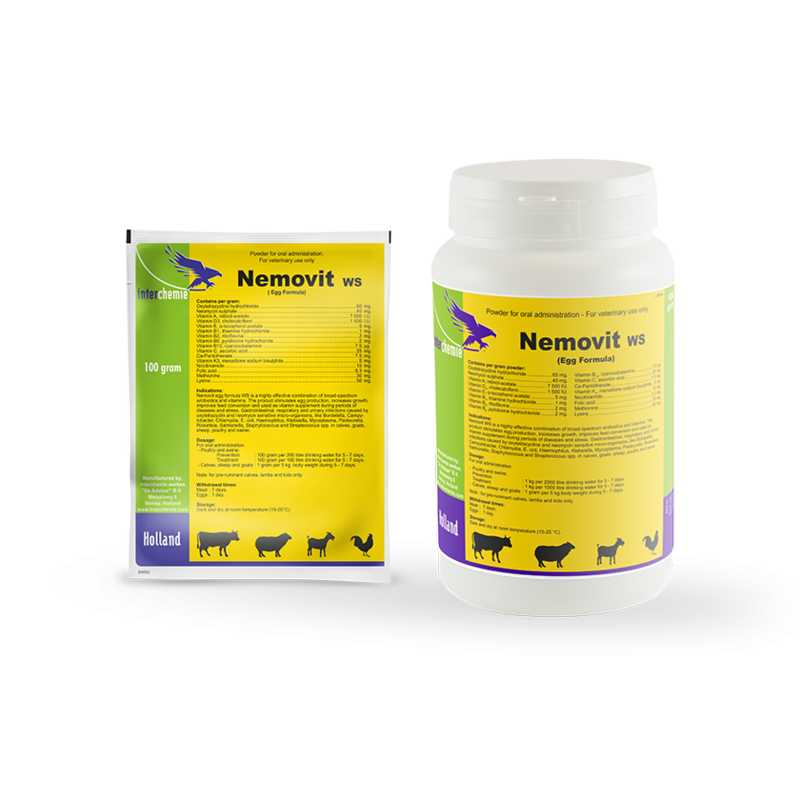 Nemovit WS is a highly effective combination of broad-spectrum antibiotics and vitamins. Oxytetracycline belongs to the group of tetracyclines and acts bacteriostatic against many Gram-positive and Gram-negative bacteria like Bordetella, Campylobacter, Chlamydia, E. coli, Haemophilus, Mycoplasma, Pasteurella, Rickettsia, Salmonella, Staphylococcus and Streptococcus spp. The action of oxytetracycline is based on inhibition of bacterial protein synthesis. Oxytetracycline is mainly excreted in urine, for a small part in bile and in lactating animals in milk. Neomycin is an aminoglycoside with a bactericidal action against mainly Gram-negative bacteria like E. coli, Klebsiella, Pasteurella and Salmonella spp. Vitamins are essential for the proper operation of numerous physiological functions. Nemovit WS is a highly effective combination of broad-spectrum antibiotics and vitamins. The product stimulates egg production, increases growth, improves feed conversion and is used as a vitamin supplement during periods of diseases and stress. Gastrointestinal, respiratory and urinary infections caused by oxytetracycline and neomycin sensitive micro-organisms, like Bordetella, Campylobacter, Chlamydia, E. coli, Haemophilus, Klebsiella, Mycoplasma, Pasteurella, Rickettsia, Salmonella, Staphylococcus and Streptococcus spp. in calves, goats, sheep, poultry and swine. Hypersensitivity to tetracyclines or aminoglycocides. Concurrent administration of bactericidal agents like penicillins. Prevention : 1 kg per 2000 litres of drinking water for 5 - 7 days. Treatment : 1 kg per 1000 litres of drinking water for 5 - 7 days. 1 g per 5 kg body weight during 5 - 7 days. Note: for pre-ruminant calves, lambs and kids only.